“Bright World of Metals”, the metal fair quartet of GIFA, METEC, THERMPROCESS and NEWCAST, gathered more than 2,180 exhibiting companies and 78,000 visitors from more than 120 countries during June 16-20, 2015 in Düsseldorf, Germany. 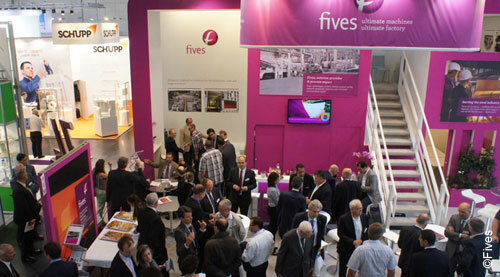 Fives exhibited at THERMPROCESS, a fair with more than 40 years of history that gathered the crème de la crème of the thermal technology suppliers in halls 9 and 10. Marking the true synergy of its multi-sector activities, Fives demonstrated its latest technologies and innovations for the combustion, aluminium, steel and induction industries. Advanced combustion solutions were presented by North American aluminum melting & holding furnaces, steel forge furnaces and engineering services with a focus on lifecycle operation. “Globally customers are very interested in TwinBed®II regenerative burners allowing for low NOx emission and high fuel savings, which lowers their overall production costs and reduces carbon dioxide emissions by nearly 50%”, highlighted Clive Lucas, Aluminium Industry Coordinator at Fives North American Combustion, Inc. The company has also introduced its newly patented diffuse mode combustion technology Tempest® DMC that achieves ultra-low NOx emission and excellent temperature uniformity in forge and heat treat applications.